The Roman-Egyptian mummy — which resides at the Garrett-Evangelical Theological Seminary on Northwestern’s Evanston campus — is one of only approximately 100 portrait mummies in the world. These mummies have an extremely lifelike painting of the deceased individual incorporated into the mummy wrappings and placed directly over the person’s face. The Romans introduced to Egypt these 2-D portraits of the dead after almost 3,000 years of idealized 3-D images. (Think King Tut). Just over three feet long, the little girl’s body is swaddled in a copious amount of linen. The outermost wrappings have been arranged in an ornate geometric pattern of overlapping rhomboids and also serve to frame the portrait. The face, painted with beeswax and pigment, gazes serenely outward, her dark hair gathered at the back. She is wearing a crimson tunic and gold jewelry. 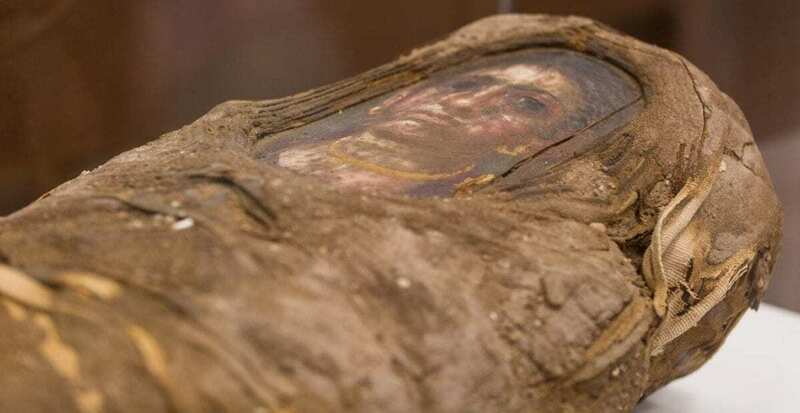 “Intact portrait mummies are exceedingly rare, and to have one here on campus was revelatory for the class and exhibition,” said Marc Walton, a research professor of materials science and engineering at Northwestern’s McCormick School of Engineering. He is teaching the fall quarter class with Taco Terpstra, assistant professor of classics and history at the Weinberg College of Arts and Sciences. The “Paint the Eyes Softer” exhibition will reunite ancient neighbors: the girl portrait mummy is from the site of Hawara, a site close to Tebtunis, where the Hearst Museum’s mummy portraits are originally from. The Hawara, or Garrett, mummy is believed to be from a high-status family and was entombed in an underground chamber with four other mummies. The synchrotron experiment at Argonne is a modern-day version of 19th-century England’s “mummy unwrapping” parties, Walton said. 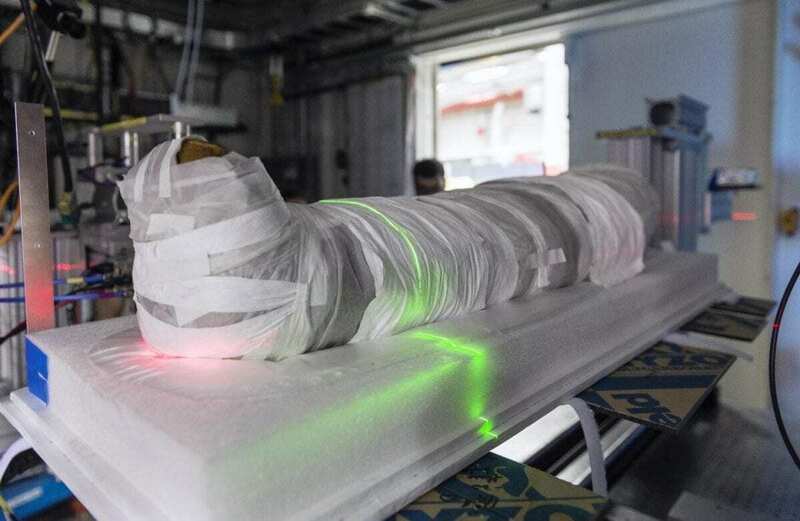 The Northwestern team collaborated with scientists at Argonne and used the extremely brilliant high-energy synchrotron X-rays produced by Argonne’s Advanced Photon Source to probe the materials and objects inside the mummy, while leaving the mummy and her wrappings intact. At the Advanced Photon Source, Stock and his team shined the pencil-shaped X-ray beam (about twice the diameter of a human hair) on areas of high-density in the mummy that were identified by the CT scan. They now will use the X-ray diffraction patterns as “fingerprints” to identify each crystalline material. For example, is the black rounded object seen on the CT scan a gold object or a rock?